** In the H2 or Cl2 molecule, the two electrons constituting the covalent bond are equally shared by the two identical nuclei. Due to even distribution of (+) and (–) charge, the two bonded atoms remain electrically neutral. Such a bond is called nonpolar covalent bond. ** However, when two different atoms are joined by a covalent bond as in HCl, the electron pair is not shared equally. ** Due to a greater attraction of one nucleus (Cl) for the electrons, the shared pair is displaced towards it. This makes one end of the bond partially positive (δ+) and the other partially negative (δ–). 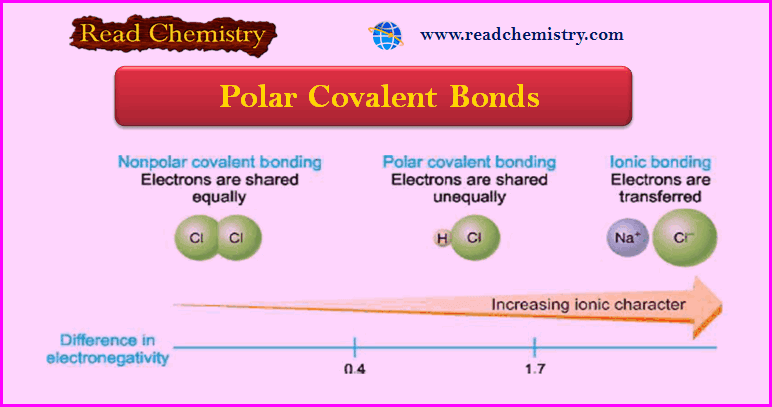 ** A covalent bond in which electrons are shared unequally and the bonded atoms acquire a partial positive and negative charge, is called a polar covalent bond. ** A molecule having partial positive and negative charge separated by a distance is commonly referred to as a Dipole (two poles). The dipole of a bond is indicated by an arrow from positive to negative end with a crossed tail as shown above in HCl molecule. ** Since two atoms of different elements do not have exactly the same attraction for electrons in a bond, all bonds between unlike atoms are polar to some extent. The amount of polarity of a bond is determined by the difference of electronegativity (or tendency to attract electrons) of the two bonded atoms. 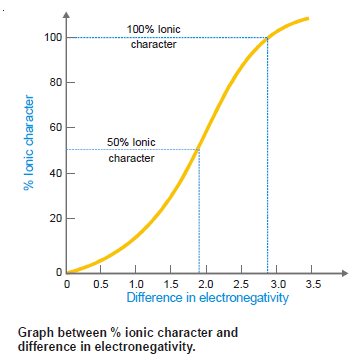 The greater the difference of electronegativity between two atoms, greater the polarity. ** As a matter of fact, if this difference is around 1.9 and 2.9, the bond is generally ionic, meaning that one atom has gained complete control of the electron pair in the bond. This equation was given by Hannay and Smith. Calculate the percentage ionic character of C–Cl bond in CCl4 if the electronegativities of C and Cl are 3.5 and 3.0 respectively? ** Water molecule (H2O) contains two O–H covalent bonds. The electronegativity of O is 3.5 and that of H is 2.1. Thus both the bonds are polar and water has a polar molecule. ** In ammonia molecule, there are three N–H bonds. The electronegativity of N is 3.0 and that of H is 2.1. Therefore all the N–H bonds are polar and ammonia has a polar molecule. ** The electronegativity of fluorine (F) is 4.0 and that of H is 2.1. The difference of electronegativities being very great, the molecule H–F has a strong dipole.